Have more questions about your resume? Contact Us and weâ��ll help! Every resume should include your contact info (usually included on the top of the resume), such as your Name, Phone Number and Email address. Also, donâ��t forget to include your Education related to the position. There are basically 3 different types of resumes to choose from. Itâ��s best to pick what you feel most comfortable, as well as whatâ��s most suitable to the position youâ��re applying for. A Functional resume focuses on your skills. : This works great if you donâ��t have a lot of job experience but you have transferrable skills from activities, volunteering, etc. You start with a Summary and follow with your different skills categorized into sections such as Leadership Skills, Computer Skills, etc. A Chronological resume focuses on your experience. : This is the most common resume format. It shows your employer all your work history, starting with the most recent. It also includes the position you held, how long you held it for and your overall job responsibilities. 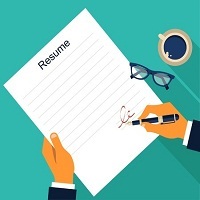 A Hybrid resume is a mix of the two styles. : It prioritizes your skills but also gives more detailed work experience information. Itâ��s recommended to keep your resume to one page if possible. Only include job information that is relevant to the position you are applying for. Have someone (or two people) review your resume for spelling, grammatical and other errors before you unleash it on the world. This is your first impression to your employer, so make it a good one. The online world today demands more than just applying with a resume. Make sure you have a complete Linkedin Profile, use Facebook and Twitter to appropriately interact with employers when you can and always follow up after you apply.